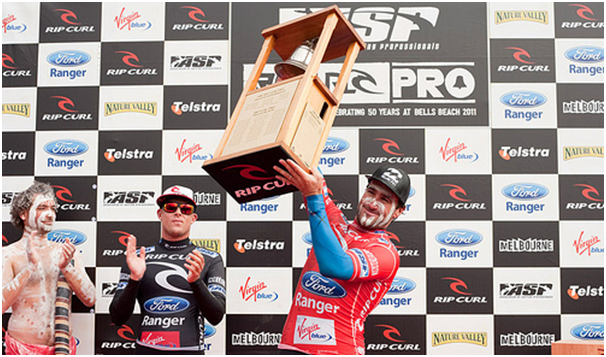 Joel Parkinson, 30 (AUS) has given Coolangatta, and the rest of Australia, a bloody good reason to get on the cans tonight; he’s just won the 2011 Rip Curl Pro at Bells Beach Victoria, presented by Ford Ranger (and he gets to ring the famous Bell!). In its 50th competition year, Parkinson got over the top of fellow Cooli kid, and close friend, Mick Fanning, 29, (AUS), to secure his 10th tour win overall, and increase his rankings on the tour leader board. A max capacity crowd gathered at the water’s edge to watch the two Aussie boys go head to head in the final of the longest running ASP tour event. Getting off to an early start, Parkinson secured an 8.53, and not long after, backed it up with 7.60. Parkinson pulled out the moves early, leaving Fanning sitting out back, pondering his next move. With Fanning being the inform surfer over the whole competition period, Parkinson had to act quickly, and that he did. Fanning responded with beautiful high-speed curvy turns and trademark cutbacks, but it wasn’t enough to catch Parkinson. In the dying seconds, Parkinson used his priority to stop Fanning taking off on a beauty of a wave, and as a result, he secured a 10 point ride. Parkinson received the highest wave score for the entire competition in the finals (a perfect 10), however, Fanning took second and third places with a 9.93 (round 4) and a 9.70 (Semis). Fanning surfed amazingly throughout the event, notching up the highest total score 19.10 (round 4) and an 18.97 (Semis). Both boys had good heats, with consistent wins, and good scores over their opponents, with the final coming down to who had enough juice left in their tank, and who could select the best waves. The last time the boys surfed head to head was in 2009 at Kirra, Queensland, where Parkinson came out triumphant. With the Rip Curl pro event in full swing from day two, the competition wraps up quickly on Easter Sunday, which it has not done for some period of time. 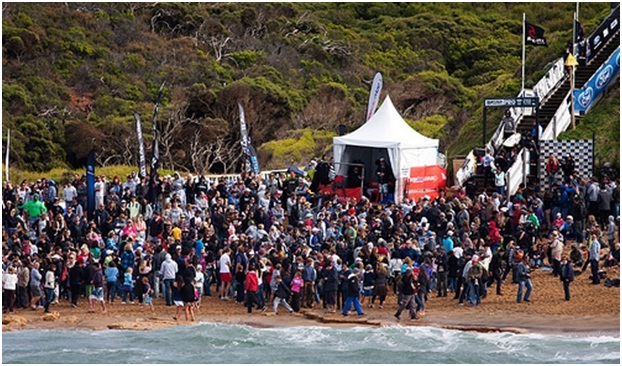 Highlighted above, a packed Bells beach for the 2011 Rip Curl Pro final. The men now travel to Rio de Janeiro, Brazil, for the Billabong Rio Pro, May 11th – 22nd. And in other surf news.. 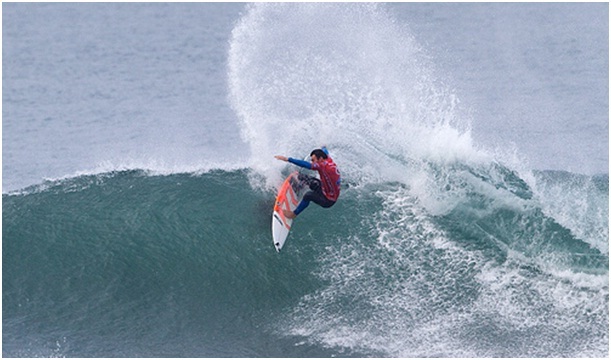 The Rip Curl search event has named its destination for stop 10 of the ASP world tour. This year, the surfers will be charging ‘somewhere in San Francisco’. Stay tuned for more information. 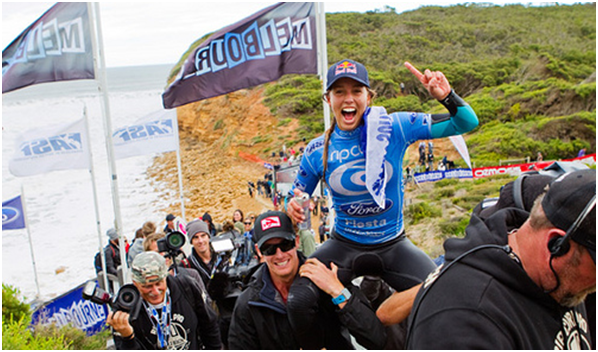 Sally Fitzgibbons claims maiden victory at Rip Curl Pro, Bells Beach. Sally Fitzgibbons (AUS), 20, has claimed her maiden tour win at the 50th Rip Curl Women’s Pro Bells Beach, presented by Ford Fiesta, over current World Tour leader Carissa Moore (HAW), 18, in solid 3-4 foot conditions at Rincon. Getting off to a fabulous start, Fitzgibbons posted scored an overall 16.77 (out of 20), demonstrating a high degree of focus for the prestigious Bells trophy. Throughout the event, Fitzgibbons secured excellent scores, getting through round 1 easily, and then striking difficulty against Coco Ho in round 3. Luckily, the new format enabled Fitzgibbons to surf again in an elimination heat in round 4. The Quarter finals loomed, and Fitzgibbons faced Ho again. This time, Fitzgibbons showed Ho who is boss, with an 18.56. She then progressed to the Semi’s and knocked out 4x World Champion Steph Gilmore with a score of 18.37, leaving Gilmore needing an 18.38 combination (two waves equaling 18.38) in order to take the lead. After her Semifinal with Gilmore, Fitzgibbons said “it’s one of the days Rincon can be your best friend or worst nightmare”. Clearly, today Rincon and Fitzgibbons were best friends. With unstoppable wave riding, and progressive surfing, Fitzgibbons had the top two highest wave scores for the women’s competition, a 9.93 and 9.83 (both round 4), and also secured the top three highest totals, with 18.83 (round 4), 18.56 (Quarters) and 18.37 (Semis). Let’s not forget Carissa Moore. Hailing from Oahu’s north shores in Hawaii, Moore had a decent run through the heats, with only a slight scare in round 1, finishing second to Pauline Ado (FRA), but beating Grom Search winner and wild card entrant Nikki Van Dijk (AUS). With her highest combination score of 18.23 in round two, the Quicksilver Pro, Snapper Rocks winner, was looking for her consecutive tour title. With the girls having surfed numerous times over the course of the day, the ever so fit Sally Fitzgibbons, who ‘couldn’t feel her arms and legs’ struggled to hold the massive Bell trophy above her head. ‘You’ve got to win it to ring it’ is how the show rolls at Bells. The men completed round 4 today, with big boys Mick Fanning, Joel Parkinson, Jordy Smith and Kelly Slater progressing straight to the Quarters, whilst 2nd and 3rd will battle it out in round 5 for their spot in the Quarters. With the women’s competition over, the guys and gals now part ways, with the girls next stop in Taranaki New Zealand, for the Subaru Pro TBS Bank Women’s Surf Festival (April 27th – May 1st). The men will be heading to Rio de Janerio, Brazil for the Billabong Pro (May 11th – 22nd). Be sure to tune into www.life.ripcurl.com tomorrow from 7am for all the live of round 5 and finals action at Bells. Images courtesy of Rip Curl.